The nation’s most luxe Airbnbs aren’t in the busy, bustling metros you’d expect. In fact, according to a new analysis, the country’s single most expensive short-term rental is in the heart of Midwest: in a quaint small town just outside of St. Louis, Missouri. With 80 acres of rolling hills, accommodations for 16-plus guests and a whopping $12,000 a night pricetag, Missouri’s Red Rock Ranch is the nation’s costliest Airbnb. The digs are stocked with a full bar, and guests have access to a private chef, cleaning services, fishing equipment, six ATVs and guns for target shooting. The bigger takeaway? According to analysis from Upgraded Points, which covers rewards in the travel and finance industries, rent on just one night at the ranch could pay for nearly three full years of rent on an average house in the area. Juneau also claims one of the nation’s most expensive Airbnbs with its VIP Yacht Charter. At $10,000 per night, the 95-foot luxury yacht hosts up to six guests and can tow a 28-foot fishing tender. Guests can fish, enjoy gourmet meals and get up close and personal with waterfalls. There’s also a hot tub and indoor fireplace on the vessel. 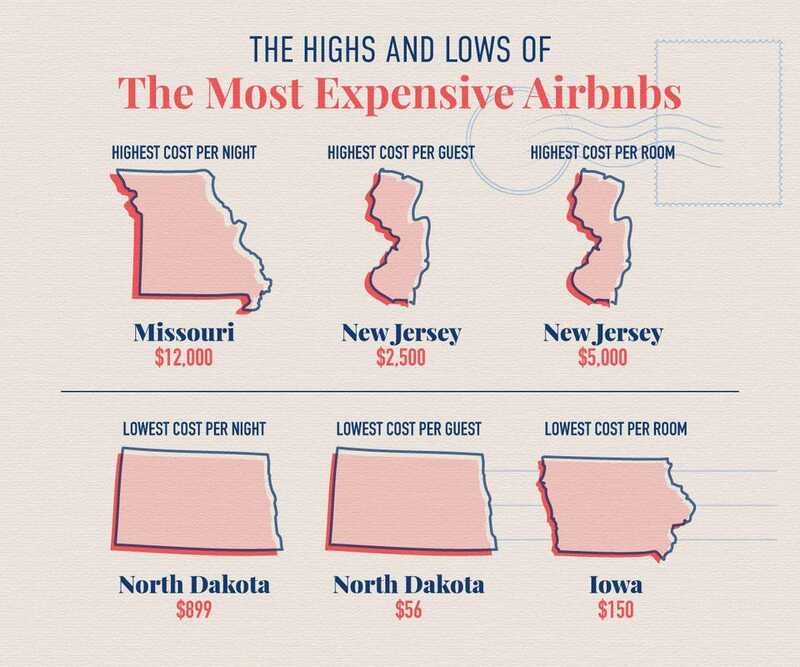 Hamilton, Illinois — about halfway between Kansas City and Chicago — claims another of the nation’s costliest Airbnb rentals. For $10,000 per night (31 months of local rent), up to eight guests can enjoy this four-bedroom, seven-bath palatial property right on the Mississippi River. The home takes up a full city block and comes with an optional private chef (who can prep a diet-friendly three- to 10-course meal) as well as an on-site elevator, gym, hot tub and pool. 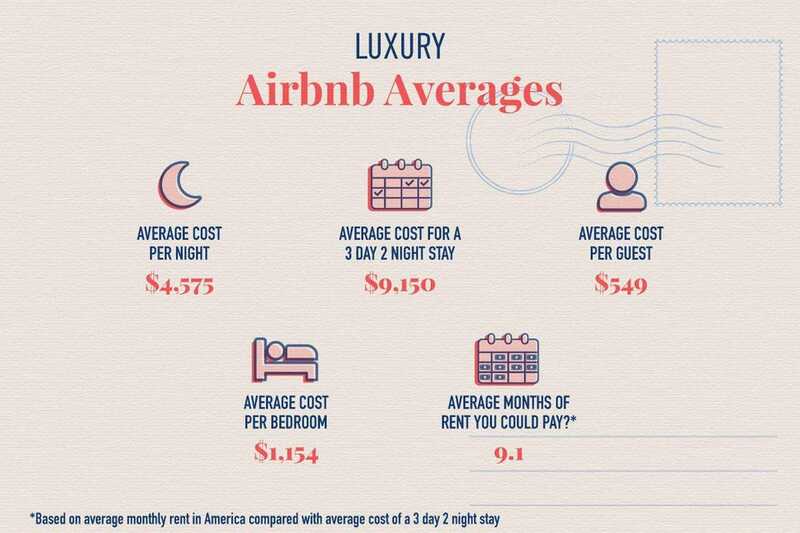 On average, luxury Airbnbs cost just under $4,600 per night, with an average three-day, two-night stay clocking in at $9,150. Nationwide, the average luxury rent could pay for nine months of rent in the city it’s located in. The most affordable luxury Airbnb experiences are in Fargo, North Dakota (just $899 per night) and Bentonville, Arkansas ($1,295 per night). If you’re really looking to scrimp — and going luxe isn’t a necessity — Phoenix is the best place to rent a room. The average daily rate is just $32 a night.